As Belgium is an export-driven economy, the outcome of the 2017 elections held in the Netherlands, France and Germany – Belgium’s main trading partners - is very important. Slowdowns in one market may lead to spill-overs and heightened risks for its trading partners. 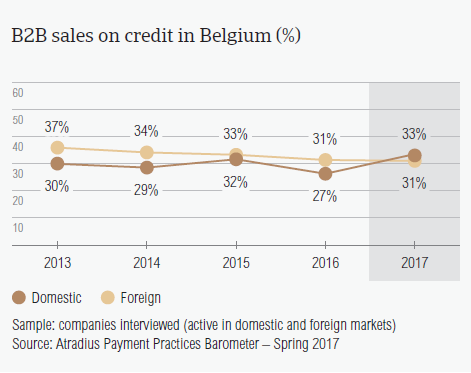 Despite a strong aversion to granting trade credit to B2B customers, Belgium saw a modest increase in the use of credit-based transactions. After a decrease to 29% was registered in the 2016 survey, the proportion of B2B sales on credit increased to 31.8% this year. 32.6% of the sales to domestic B2B customers and 31% of the sales to foreign B2B customers were transacted on credit. The minor difference between domestic and foreign sales on credit terms indicates that there is an almost uniform perception of the risk of payment default between the two. Compared to their peers in Western Europe (38.8%), respondents in Belgium (31.8%) seem less inclined to sell on credit terms to B2B customers. Belgium has a conservative payment culture and prioritises cash over other methods of payment. This was also observed in France (29.3% of sales on credit), Switzerland (28%), Germany (26.5%) and Austria (26.5%). 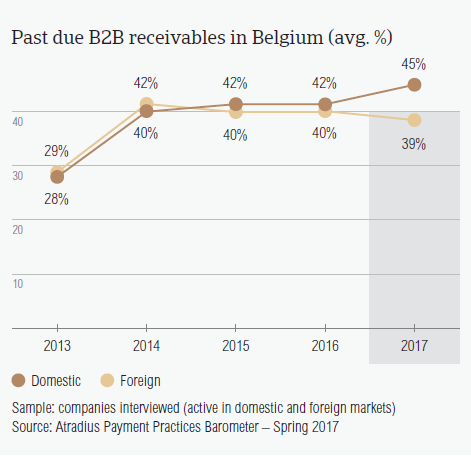 The modest increase in the percentage of B2B invoices in Belgium (42%), shows a uniform trend observed across the Western European countries surveyed. The percentage of respondents who have reported late payments from their B2B buyers in Belgium (93.5%) is higher than the regional average (87.8%) and has increased compared to 2016 (90.7%). About half of the invoices of respondents in Belgium were not paid by the due date (42%). This is one percentage point higher than in 2016 and slightly more than the 41% regional average. Belgium’s Days Sales Outstanding Figure (DSO) reflects the slightly increased proportion of late payments. In 2017, the DSO figure averaged 50 days and is significantly higher than the regional average of 44 days. Compared to 2016, the average DSO was one day shorter this year. This means that respondents in Belgium have to wait about as long as last year to turn B2B receivables into cash. Looking forward, most respondents in Belgium (57.8%) do not expect a change in their average DSO over the next 12 months. 19.6% expect a slight increase over the same time frame while 14.2% are more optimistic and expect a slight decrease in the average DSO. In 2017, average payment terms in Belgium remained quite stable while payment delays showed a mixed picture. Average payment terms in Belgium have been lengthened by one day compared to 2016 levels. In 2017, respondents in Belgium asked their B2B customers to pay their invoices within 30 days. The average payment terms in Belgium are two days shorter than the average of Western Europe (32 days) and they are in line with those of Ireland. Domestic B2B customers (28 days) are required to pay their invoices a few days earlier than foreign customers (32 days). This minor difference between the two types of customers was also evident in previous years. Respondents in Belgium reported an increase of four days in the average payment delay of domestic B2B customers (30 days) compared to one year ago (26 days). Foreign B2B customers on the other hand seem to pay their invoices faster with a delay of 20 days (five days earlier than in 2016). The shorter payment terms may reflect Belgian suppliers’ concerns about the impact of the challenging economic environment on the liquidity position of their B2B customers. Like in 2016, respondents in Belgium have to wait about 55 days to turn B2B receivables into cash. 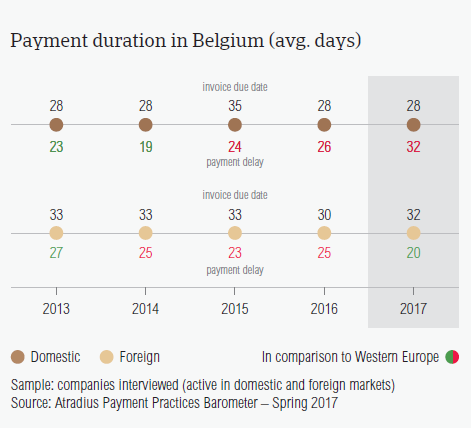 The main reasons for payment delays by domestic and foreign B2B customers in Belgium are the same as those reported in Western Europe. B2B customers of respondents in Belgium delayed payments most often due to insufficient availability of funds (domestic: 53.1%, foreign 34.3%). This is notably less than one year ago (domestic: 58.2%; foreign: 42.6%) and in line with the regional averages (domestic: 52.6%; foreign: 34.5%). The buyers’ intentional use of outstanding invoices as a form of financing was the second most cited reason by Belgian respondents for payment delays (domestic: 27.1%; foreign: 29.0%). Regional averages stood at 28.2% for domestic and 23.9% for foreign B2B customers. Payment delays by domestic and foreign B2B customers, was noted by 20.1% of suppliers in Belgium as a reason why they postponed payments to their own suppliers. This is consistent with the average of 19.8% posted at regional level. 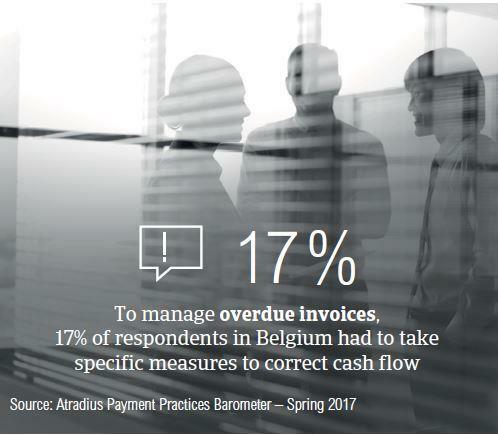 To manage overdue invoices, 17% of respondents in Belgium had to take specific measures to correct cash flow or to pursue additional financing from factors or banks because of late payments by their customers. This percentage is slightly lower than that of Western Europe overall (18%). Respondents in Belgium will increase their use of credit management tools to protect their businesses from payment delays resulting from the impact of Brexit, the slowdown in Asia and US protectionism. In general, the averages for Belgium are higher than regional averages. Fewer respondents in Belgium (41.6%) than in Western Europe (48.3%) said that they will not change their current mix of credit management tools to protect their businesses against the risks of payment defaults. 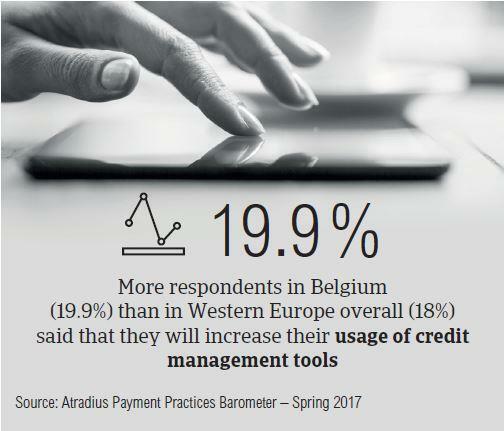 More respondents in Belgium (19.9%) than in Western Europe overall (18%) said that they will increase their usage of credit management tools. Most of them said they will do so by increasing checks on their buyers’ creditworthiness (27.8%) and through more frequent use of collection agencies (18.9%). To protect their businesses against the impact of Brexit, 28.4% of respondents in Belgium said that they will check their buyers’ creditworthiness more often while 20.5% said they will retain a collection agency. Both percentages are higher than those registered at regional level (each technique with 17.2%). 30.1% of Belgian respondents said they will increase checks on their buyers’ creditworthiness to avoid and minimise payment delays caused by US protectionism. Almost 25% of respondents in Belgium (Western Europe: 20.9%) said that they will check their buyers’ creditworthiness more often to avoid the effects of the slowdown in Asia. 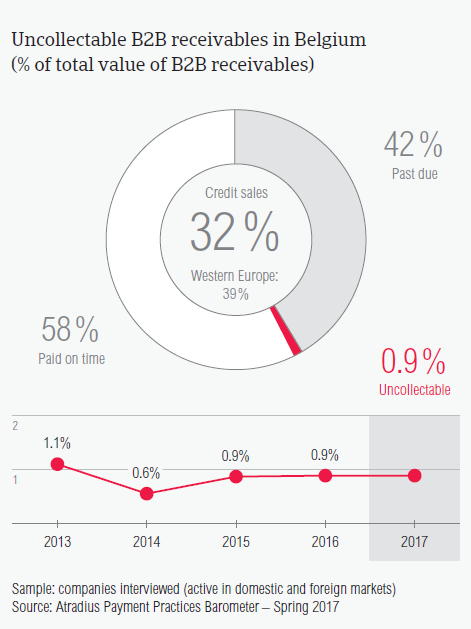 The proportion of B2B receivables reported by suppliers in Belgium as being written off as uncollectable (0.4% of the total value of B2B receivables) is below the average for Western Europe overall (0.6%). Domestic receivables were written off as uncollectable twice as often as foreign ones (domestic 0.6%, foreign 0.3%). However, the percentages of uncollectable receivables were under the regional averages (domestic 1%, foreign 0.3%). Uncollectable B2B receivables originated most often from the consumer durables, electronics and construction sectors. B2B receivables were reported to be uncollectable mainly because the customer went bankrupt or out of business (60%). Other reasons why write-offs were made: debts too old (25%) and the inability to locate the customer (23.5%). 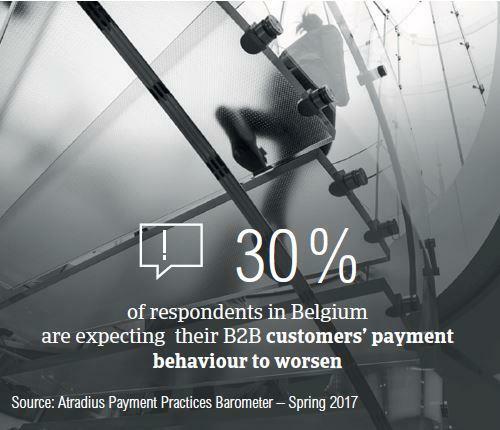 30% of the respondents surveyed in Belgium expect to see a slight deterioration in the payment behaviour of their B2B customers over the coming 12 months. In 2017, B2B customers in the construction (38 days), services (36 days) and chemicals (32 days) sectors enjoyed payment terms longer than the average payment terms at country level (30 days). Belgian respondents asked customers in the textiles and electronics sector to pay their invoices faster (around two weeks from the invoice date). B2B customers in the paper and consumer durables industries took the longest to settle their payments of overdue invoices (53 and 50 days respectively). The main reason explaining the delays was insufficient availability of funds (paper 67%, consumer durables 45%). Slightly more respondents in Belgium (60%) than in Western Europe (58%) said that they don’t expect changes in the payment behaviour of their B2B customers over the next 12 months. A notably higher percentage of respondents (30%) are expecting a deterioration than an improvement (14%) in the payment behaviour of their B2B customers over the same time frame.